The EOS 6D DSLR camera is the ideal tool for unlocking your creative vision. It features a 20.2 Megapixel Full-Frame CMOS sensor, a wide ISO range of 100-25600, expandable to 50, 51200, and 102400, for incredible image quality even in low light, and a DIGIC 5+ Image Processor delivers enhanced noise reduction and exceptional processing speed. A new 11-point AF including a high-precision center cross-type AF point with EV -3 sensitivity allows focusing in extreme low-light conditions, and with continuous shooting up to 4.5 fps, you are ready to capture fast action. Full HD video with manual exposure control, multiple frame rates, and the benefits of a Full-Frame sensor provides stunning performance and creative flexibility. The built-in Wi-Fi® transmitter allows you to wirelessly transfer your images to social networking sites through CANON iMAGE GATEWAY, or upload virtually anywhere from your iOS or Android smartphone with the free download of the EOS Remote app. You can use your smartphone for remote camera control and operation (with the EOS Remote app), or even print your images on a Wi-Fi® compatible printer. Perfect for travel and nature photography, the built-in GPS allows location data to be recorded while shooting. Compact, lightweight, brilliant low-light performance, and loaded with easy to use features, the EOS 6D is truly the Full-Frame DSLR camera for everyone. 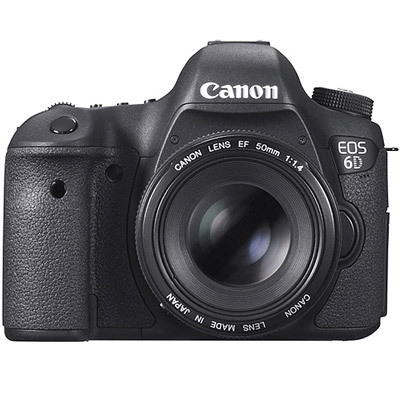 Canon EOS 6D camera is available for hire from RENTaCAM Sydney.